Inform SDL that the user has activated an application. 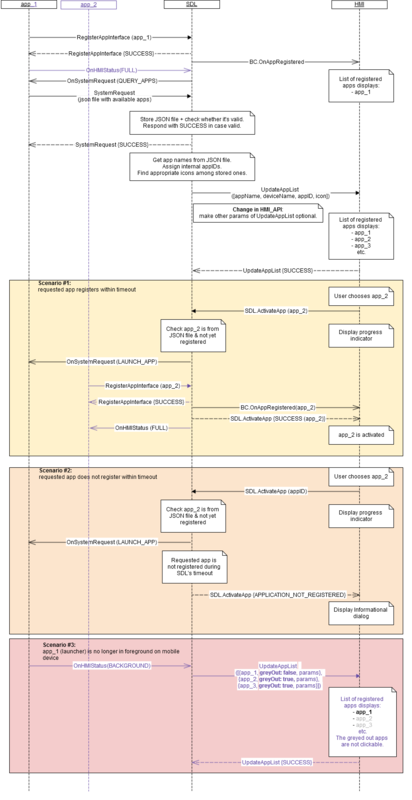 Send a request to SDL to get messages for specified permissions (via GetUserFriendlyMessage) and notify user that provided permissions of application were decreased in case HMI gets "isAppPermissionRevoked:true" respond from SDL PoliciesManager. 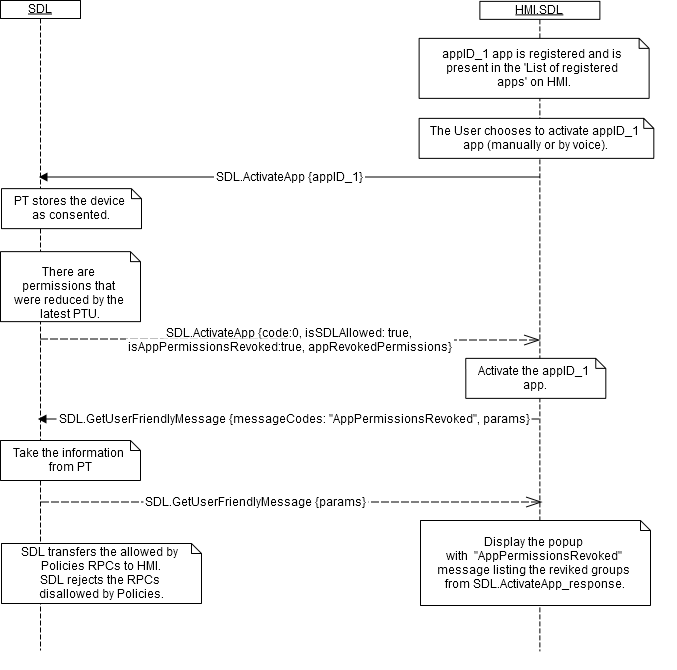 Send GetListOfPermissions request to SDL in order to obtain list of message codes for functional groups needed by application for user to consent when PoliciesManager responds with "isPermissionsConsentNeeded: true" . Display Dialog and on result of user selection to send OnAllowSDLFuncionality specifying device from ActivateApp response, source of choice (UI/VR) and allowed set to true/false (if user ignores question, this is automatically set to false) when HMI receives SDL.ActivateApp (isSDLAllowed: false). 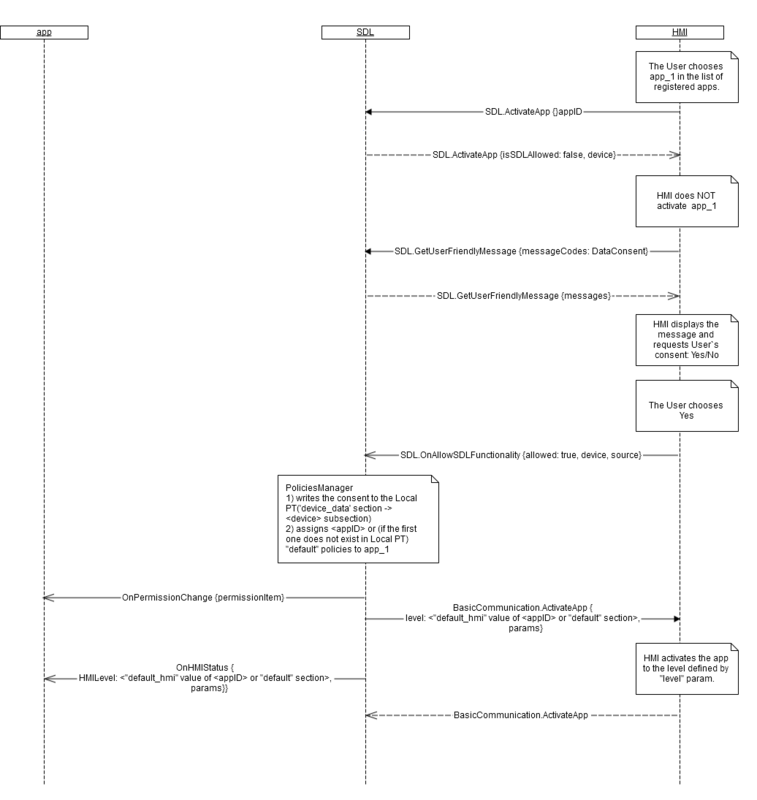 respond with "isPermissionsConsentNeeded: true", otherwise "isPermissionsConsentNeeded: false" should be returned to HMI, in case SDL got SDL.ActivateApp from HMI and LocalPT contains the permission that require User`s consent. 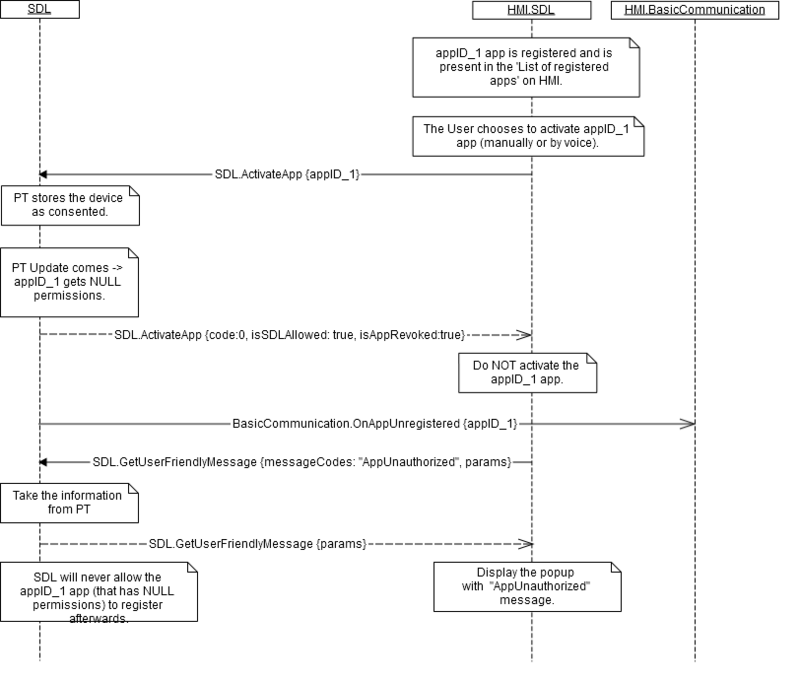 respond with "isSDLAllowed: true" in the response to HMI, on getting SDL.ActivateApp from HMI and the device the app is running on is consented by the User. 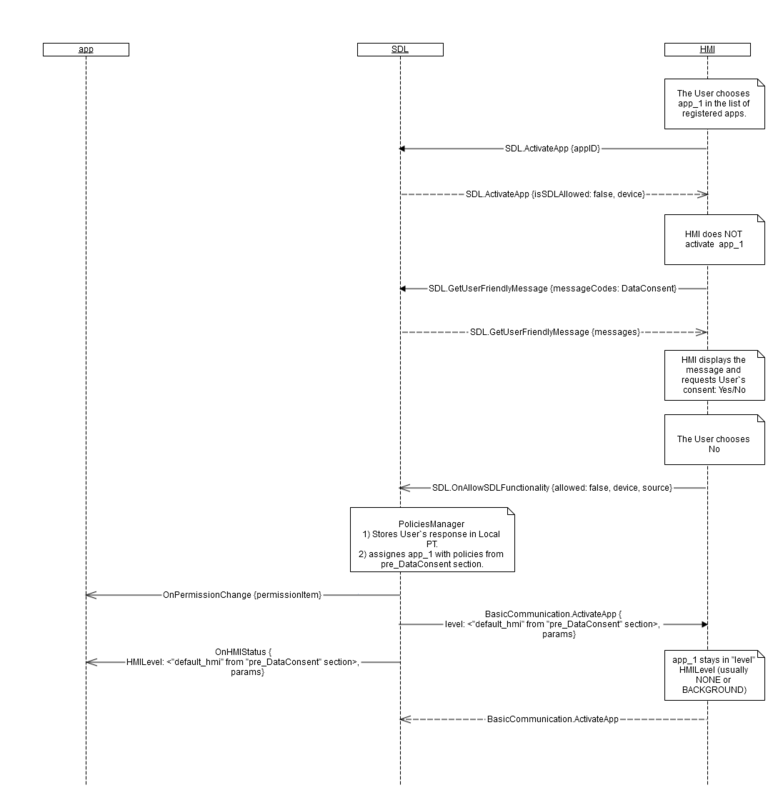 device param containing the device`s name and ID previously sent by SDL via UpdateDeviceList. appID Integer true ID of the application that the User has chosen. isSDLAllowed Boolean true SDL returns:‘true’, in case the User has allowed using the device for PolicyTable Exchange. ‘false’, in case the User has not yet been asked for or in case the User has disallowed using the device for PolicyTable Exchange. a. Device is connected to the HU. b. App_1 is running on this device and is registered with SDL. c. App_1 presents in the list of registered apps on HMI. The User does NOT consent the device. The User consents the device.